A regular breeding resident and migrant; the Mourning Warbler was common during the Minnesota Breeding Bird Atlas (MNBBA). Distributed across the northeastern and upper Midwest and throughout Canada from Newfoundland and Labrador to northeastern British Columbia (Figure 1). Highest densities in North America are found in northeastern Minnesota and parts of Ontario. Assigned a Continental Concern Score of 12/20 by Partners in Flight, which designated the Mourning Warbler as a continental and regional stewardship species. Long-distance Neotropical migrant, over winters in Central America and northwestern South America. Cup-nest on or near the ground in a well-concealed location. Breeding distribution and relative abundance of the Mourning Warbler in North America based on the federal Breeding Bird Survey from 2011 to 2015 (Sauer et al. 2017). Roberts (1932) described the species as well distributed in northern and north-central forested areas and their fringes south to Isanti County and westward to Marshall and Polk Counties. He reported nesting activity from Aitkin, Carlton, Cass, Cook, Isanti, and St. Louis Counties as well as east-central Minnesota and the Mille Lacs area. As recorded by Roberts (1932), accounts of the Mourning Warbler by T. Martin Trippe in the summer of 1870 describe the warbler as a “common nesting bird” in the region from Carlton County west to Otter Tail Lake. He made these observations while laying out the route of the Northern Pacific Railroad. Roberts described Trippe’s information as of special interest because these data “supplied a missing chapter in the life history of a bird about which little was known up to that time.” In addition, Roberts (1932) stated that Dr. Coues in 1873 found Mourning Warblers “breeding abundantly along the Red River, between Dakota and Minnesota.” Roberts himself in 1880 found possible evidence of a “pair, evidently with young,” in Sherburne County and commonly observed them in “burned-over” areas of Stearns County in 1881. Roberts also identified numerous accounts of the commonness of the species in Carlton County, near Duluth, and its abundance “in the vicinity of Virginia, Hibbing, Biwabik, and elsewhere on the Mesabi Iron Range of northern St. Louis County.” He suggested based on these accounts that it “is apparently more abundant in the extreme northern part of the state than it is in the central counties.” Undoubtedly the species nested in many additional counties and locations, but the lack of observers and the difficulty in finding nests likely restricted additional confirmations. Green and Janssen (1975) included a similar distribution with additional inferred or confirmed nesting from Clearwater, Hubbard, Itasca, Lake, Otter Tail, and Roseau Counties. They also emphasized the presence of singing males in Anoka, Hennepin, and Washington Counties in the Twin Cities area. Several years later, Janssen (1987) documented confirmed nesting in seven counties since 1970 including Aitkin, Clearwater, Cook, Lake, Pine, St. Louis, and Washington Counties. Hertzel and Janssen (1998) would later add Anoka and Dakota Counties to the list of confirmed counties where nesting has been observed since 1970. The Minnesota Biological Survey (MBS) included 744 breeding observation locations during their counts, which were distributed throughout most of the areas previously described. The MBS also recorded observations but not confirmed nesting from several other counties not included in the general breeding range of Janssen (1987) or Hertzel and Janssen (1998). These included Fillmore, Hennepin, Sibley, Stearns, and Wright Counties as well as records that straddled Renville/Nicollet and Scott/Dakota Counties. The extensive coverage of the MNBBA included 1,988 records and verified the broad breeding distribution in the state. Confirmed nesting not previously reported included Becker, Beltrami, Lake of the Woods, and Morrison Counties (Figure 2). As is the case for many species in which nests are difficult to find, only 6% of all blocks where the species was observed had confirmed nests (60 confirmed out of 975 total blocks) (Figure 3; Table 1). The Minnesota predicted probability map emphasized its highest populations in northeastern Minnesota with potentially isolated populations west to Becker County and south to the Twin Cities metropolitan area (Figure 4). Highest densities were predicted in Cook, Lake, and St. Louis Counties, eastern Koochiching County, eastern Pine County, and northeastern Itasca County.The probability map fits well with the relative abundance map produced by the federal Breeding Bird Survey (BBS) (Figure 1). Over the past 150 years, the Mourning Warbler’s range has contracted, especially in its southern, southwestern, and western fringes of Minnesota. The species is still relatively common and locally abundant in the north-central regions of the state, primarily in the Laurentian Mixed Forest Ecological Province. Isolated breeding populations occur outside these areas where suitable breeding habitat exists. Compared with the Wisconsin breeding bird atlas (Cutright et al. 2006), the species appears to have a more restricted distribution in Minnesota. Confirmed nesting and breeding observations in Wisconsin extended much farther south into the Iowa Driftless region and even a confirmed nesting in the most southeastern county of Wisconsin (Grant County). Roberts (1932) makes no mention of breeding activity in southeastern Minnesota, except for spring migration in Goodhue County. In an extensive effort of nest searching from 1996 to 1998 in southeastern Minnesota by Knutson et al. (2004), no observations out of 975 nests found were of this species. Minnesota represents a relatively large component of the North American breeding population of this species, which is largely concentrated in the western Great Lakes region (Figure 1). Based on the BBS, the highest population levels include a substantial part of the province of Ontario, northern Michigan, Minnesota, and Wisconsin and extend up to south-central Manitoba. Breeding distribution of the Mourning Warbler in Minnesota based on the Breeding Bird Atlas (2009 – 2013). Summary statistics of observations by breeding status category for the Mourning Warbler in Minnesota based on all blocks (each 5 km x 5 km) surveyed during the Breeding Bird Atlas (2009-2013). Summary statistics for the Mourning Warbler observations by breeding status category for all blocks and priority blocks (each 5 km x 5 km) surveyed during the Minnesota Breeding Bird Atlas (2009-2013). Predicted breeding distribution (pairs per 40 hectares) of the Mourning Warbler in Minnesota based on habitat, landscape context, and climate data gathered during the Minnesota Breeding Bird Atlas (2009-2013) using the General Linear Modeling method with an adjustment for detectability. The Mourning Warbler is broadly described as nesting in upland early successional cover types resulting from forest disturbances such as logging, fire, and wind; tree fall gaps; second growth; and edges with thick understories (Pitocchelli 2011). In north-central Minnesota, Collins et al. (1982) estimated breeding habitat canopy closure between 40% and 77%, while Cox (1960) estimated ground cover ranging from 18% to 59%. Niemi and Hanowski (1984) found the species abundant 2–10 years following logging activity in northeastern Minnesota, especially on sites with thick undergrowth (Figure 5). Beer (1958) described breeding observations from 1947 to 1957 in the area around Basswood Lake north of the city of Ely, where extensive tent caterpillar defoliation occurred. He did not observe the species from 1947 to 1949, but it began to appear as the canopy opened, trees died, and a brushy understory developed. By 1956 and 1957 it was moderately common. Its habitat associations among point counts gathered during the MNBBA period indicated a strong association with upland coniferous, northern mixed, pine, and lowland coniferous forest landscapes (Figure 6). The National Forest Bird Monitoring program (NFB) indicated a significant habitat association with recently cut areas such as open, dry uplands and regenerating forest cover types on the basis of over 4,000 observations from 1995 to 2010 (Niemi et al. 2016). The regenerating habitats included those up to 20 years of age following logging activity. The species was also found commonly but less abundantly in aspen birch, aspen-spruce-fir, and red pine cover types. Niemi and Probst (1990) emphasized its high colonization rates following forest fire. However, in a comparison of 46 equally distributed sites between burned and logged areas of similar age, Schulte and Niemi (1998) found Mourning Warblers more abundant in logged areas. Similarly, Zlonis and Niemi (2014) found the species more common in managed second-growth forests compared with adjacent wilderness forests, even though the latter included a history of natural disturbances. Typical breeding habitat of the Mourning Warbler in Minnesota (© Gerald J. Niemi). Habitat profile for the Mourning Warbler based on habitats within 200 m of point counts where the species was present during the Minnesota Breeding Bird Atlas (2009-2013). Partners in Flight (Rosenberg et al. 2016) estimated a North American breeding population of 16 million breeding adults, with 800,000 in Minnesota (Partners in Flight Science Committee 2013). Using MNBBA data, Minnesota’s breeding population was estimated at 1.91 million breeding adults (95% confidence interval was 1.72 – 2.25 million), which would represent about 8% of the global breeding population. The majority of the breeding population occurs in Canada. BBS population trends for the Mourning Warbler have significantly declined in Minnesota from 1967–2015 by 1.01% per year (Figure 7). Overall these decreases in the population are consistent with survey-wide counts (decreasing 1.18% per year) and are more severe in Canada (decreasing 1.27% per year). Patterns of BBS trends illustrate widespread shrinking populations throughout its breeding range, including population decreases in northern and north-central Minnesota (Figure 8). Partners in Flight (Rosenberg et al. 2016) estimated a 45% decline in the North American breeding population of Mourning Warblers from 1970 to 2014. NFB trends also indicated a significant decline over the past 22 years (1995–2016) of 1.1 % per year in the Chippewa and Superior National Forests combined (Figure 9). Overall estimates of population density from the long-term NFB monitoring program ranged from 4.2 to 7.9 pairs per 40 ha in the Chippewa and Superior National Forests, respectively. Densities were highest in the northeastern regions and generally decline to the west, southeast, and south, as illustrated in Figures 1 and 4. Within individual forest cover types where the species is frequently present, densities range from 2.1 to 6.2 pairs per 40 ha to high counts of 8.3 to over 25.0 pairs per 40 ha in early successional cover types. 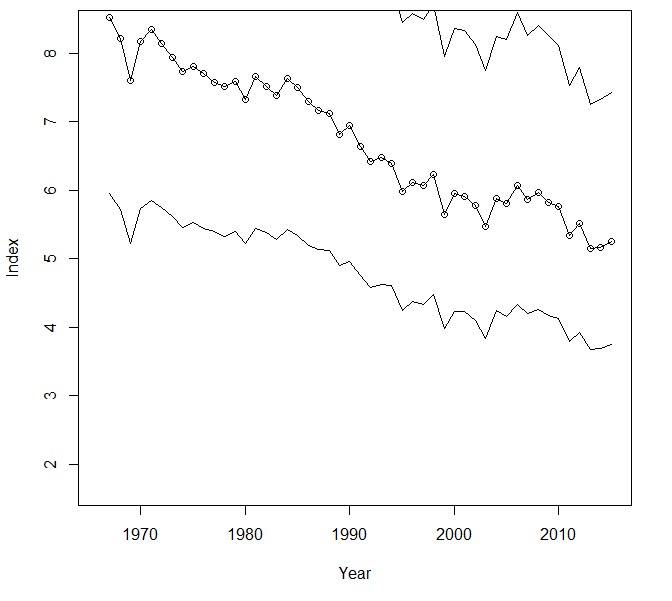 Breeding population trend for the Mourning Warbler in Minnesota for 1967–2015 based on the federal Breeding Bird Survey (Sauer et al. 2017). Breeding population trend map for the Mourning Warbler in North America for 1966–2015 based on the federal Breeding Bird Survey (Sauer et al. 2017). 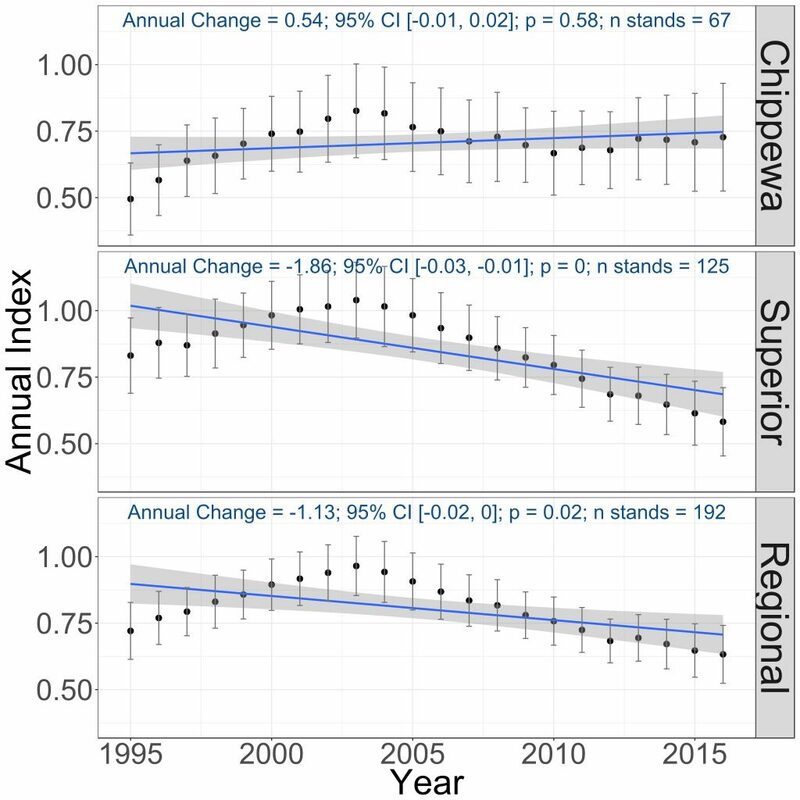 Breeding population trends of the Mourning Warbler in the Chippewa and Superior National Forests and the combined regional trend, (1995–2016) (Bednar et al. 2016). The Mourning Warbler has a high overall score by Partners in Flight (Rosenberg et al. 2016) of 12/20 but has very limited official conservation status. Its widespread population declines and large loss of its breeding populations in North America are adequate cause for alarm. It is still a common bird species and is locally abundant in many suitable habitat areas within its range. It is also known to respond positively to most management manipulations (Pitocchelli 2011). Numerous studies in Minnesota have shown positive population responses following logging activity (Niemi and Hanowski 1984; Hanowski et al. 2003; Hanowski et al. 2005; Atwell et al. 2008) and following forest fire (Niemi and Probst 1990). Threats to this species are unclear, but maintaining an active silvicultural program to provide a constant supply of early successional vegetation has been proposed in the northeastern United States (Hunter et al. 2001). Logging activity in the state of Minnesota has been declining since 2005 and especially in Minnesota’s national forests (Niemi et al. 2016). In contrast, over the past 150 years, Minnesota has seen extensive changes in habitats and in its profile of age classes and forest cover types. Young, early successional forests are more prevalent today compared with the original vegetation. Therefore, it is possible that species like the Mourning Warbler are declining because of higher-than-normal populations in the mid‑1900s that are reestablishing their former population levels. Additional threats to the species include changes on its wintering grounds; collisions with structures such as windows, towers, and turbines; and continued effects of climate change. In its review of species susceptible to future climate change, Langham et al. (2015) and the National Audubon Society (2015) indicated the Mourning Warbler was “climate threatened” because of predicted northward shifts in its summer breeding range. Loss of suitable habitat in Minnesota was projected to be substantial by the year 2080. Atwell, Ryan C., Lisa A. Schulte, and Brian J. Palik. 2008. “Songbird Response to Experimental Retention Harvesting in Red Pine (Pinus resinosa) Forests.” Forest Ecology and Management 255: 3621–3631. Bednar, Joshua D., Nicholas G. Walton, Alexis R. Grinde, and Gerald J. Niemi. 2016. Summary of Breeding Bird Trends in the Chippewa and Superior National Forests of Minnesota – 1995–2016. Natural Resources Research Institute Technical Report NRRI/TR-2016/36. Beer, James R. 1958. “Changes in Ovenbird and Mourning Warbler Abundance at Basswood Lake, Minnesota.” Flicker 30: 22–23. Collins, Scott L., Frances C. James, and Paul G. Risser. 1982. “Habitat Relationships of Wood Warblers (Parulidae) in Northern Central Minnesota.” Oikos 39: 50–58. Cox, George W. 1960. “A Life History of the Mourning Warbler.” Wilson Bulletin 72: 5–28. Cutright, Noel, Bettie R. Harriman, and Robert W. Howe, eds. 2006. Atlas of the Breeding Birds of Wisconsin. Waukesha: Wisconsin Society of Ornithology, Inc.
Hanowski, JoAnn M., Nicholas P.Danz, James W. Lind, and Gerald J. Niemi. 2003. “Breeding Bird Response to Riparian Forest Harvest and Harvest Equipment.” Forest Ecology and Management 174: 315–328. Hanowski, JoAnn M., Nicholas P.Danz, James W. Lind, and Gerald J. Niemi. 2005. “Breeding Bird Response to Varying Amounts of Basal Area Retention in Riparian Buffers.” Journal of Wildlife Management 69: 689–698. Hunter, William C., David A. Buehler, Ronald A. Canterbury, John L. Confer, and Paul B. Hamel. 2001. “Conservation of Disturbance-Dependent Birds in Eastern North America.” Wildlife Society Bulletin 29: 440–455. Niemi, Gerald J., and JoAnn M. Hanowski. 1984. “Effects of a Transmission Line on Bird Populations in the Red Lake Peatland, Northern Minnesota.” Auk 101: 487–498. Niemi, Gerald J., and John R. Probst. 1990. “Wildlife and Fire in the Upper Midwest.” In Management of Dynamic Ecosystems, edited by James M. Sweeney, 31–46. West Lafayette, IN: The Wildlife Society, North Central Section. Schulte, Lisa A., and Gerald J. Niemi. 1998. “Bird Communities of Early-Successional Burned and Logged Forest.” Journal of Wildlife Management 62: 1418–1429. Zlonis, Edmund J., and Gerald J. Niemi. 2014. “Avian Communities of Managed and Wilderness Hemiboreal Forests.” Forest Ecology and Management 328: 26–34.